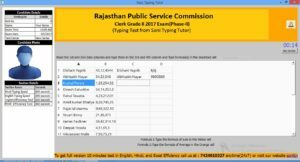 Looking for a typing and efficiency software for RSMSSB LDC exam 2018 you are most welcome to this page. I will try to provide you complete information about this exam pattern and also about the software you need for preparation. Typing speed and efficiency have an important role in RSMSSB LDC exam 2018. Final merit will be based on the marks of first phase (written exam) plus marks of second phase(typing and efficiency test). Everyone knows about typing but many don’t know what is efficiency. Efficiency means to check your skills and knowledge about MS Excel or MS Word. Last time RPSC taken a test efficiency of MS Excel only. In such a test you have to enter data into an excel sheet. (see the picture below). 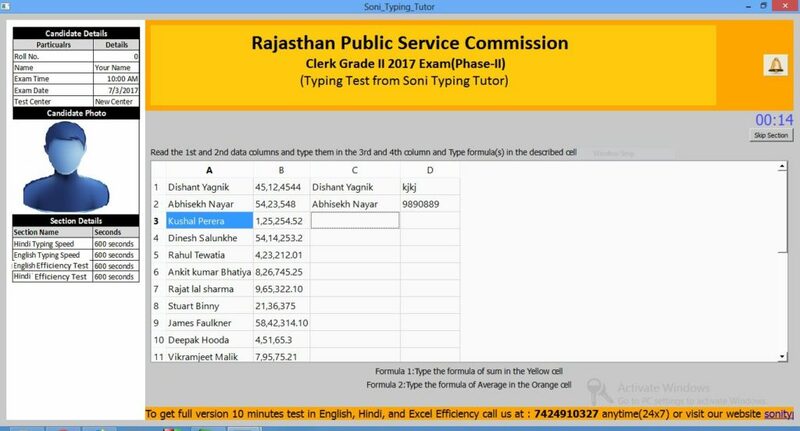 The software RPSC used for recruitment last time was not exactly MS excel instead it was a software which had a similar looking to Excel. You have to make data entry in such test. You should know typing to complete the data entry. Basic understanding of Excel and simple Excel formula is expected. Duration was 10 minutes for both Hindi and English efficiency test. So learn both Hindi and English typing and also the numeric/number typing because in such test you have to type many numbers and digits. This time LDC exam is going to be conducted by RSMSSB first time. Last recruitment of LDC was organised by RPSC in 2013. Software for RSMSSB LDC efficiency test? You can practice in Excel or you can get a special software for this purpose. Problem of using Excel is that you need to check time and marks calculation manually. Manual checking and evaluation of test takes a lot of time. Another problem you need data for the data entry. Soni Typing Tutor provides the best solution for this purpose. There are options to set the timer and take the test. You have to know just basic formula of Excel like sum, average, minimum, maximum etc. There no need to learn in depth. You can download the software from the link given below. Typing pattern was very easy. It was a line wise typing pattern. A single line is shown on the screen. You have to type the line in the given place and press ENTER key to go to the next line. (see the picture below). 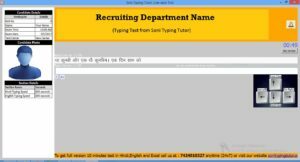 Soni Typing Tutor gives you more than 300 tests in both Hindi and English typing in line-wise-pattern. The line wise pattern was also used in DOITC Informatics Assistant exam 2013. In Soni Typing Tutor you will learn both Hindi and English typing very fast and easily. The good news is that the backspace was fully allowed in exam without any negative marking or penalty. Soni Typing tutor allows you to enable or disable backspace while typing. You can download the software from the following link. Soni Typing Tutor provides both line wise and paragraph wise typing test with efficiency test in Hindi and English. So it is a complete package for this exam. What will be the efficiency and typing pattern in 2018? There is much possibility that the typing pattern will be same as last time; it means a line wise pattern. Also the efficiency test pattern should also be same. The reason behind this possibility is the success rate of this exam pattern. Same line wise pattern was used in DOITC Informatics Assistant 2013 and RPSC LDC 2013. There was no fault in typing exam pattern and no one challenged this pattern in any court including high court. Now a days almost every exam is being challenged in courts. In such a situation the last time pattern was very good and transparent. So there is possibility that the exam will be taken in the same pattern as last time. Typing speed and accuracy calculation formula in various typing tests.